Map, 13-1/2” x 8-1/2”, uncolored, “Boston and its Environs”, publishe Phillips, 1806, withdrawn, VG. 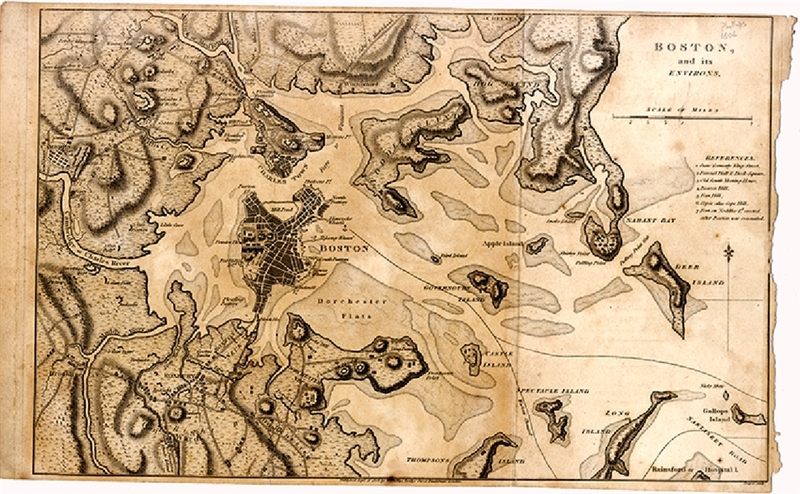 Based on Lt. Thomas Page's Revolutionary War era surveys, this very attractive map depicts metropolitan Boston as it appeared at the beginning of the 19th-century. It shows the city of Boston, towns, roads, rivers and streams in the surrounding countryside. The terrain is depicted west to Cambridge, north to Chelsea, and south to Roxbury Fort and Dorchester. The harbor is included as far east as Long and Gallops islands. Within Boston proper, Rowes Wharf is prominently labeled. There are also references to the renaming of King Street to State Street; Faneuil Hall and Dock Square; The Old South Meeting Hall; Beacon Hill; Fort Hill; Copps (alias Cope Hill); and the fort on Noddles Island which was erected after Boston was evacuated.